Palacio del Mar has the most exclusive luxury Villas in all of Rosarito. These private luxury villas deliver excellent detail and materials, natural light and ocean view. It is within these fine Villas that show the developers true experience in luxury design. Every Villa includes fine materials and expected luxuries such as travertine flooring, full wall of patio sliders and glass on the ocean side, stainless steel kitchen appliances, full granite backsplash, modern hardware in the kitchen and bathrooms, custom cabinets, built in fireplace, forced air heating, attached 2 car garage, and more. Each Villa is ocean front and has enough land in front for a private pool, patio, and or garden area. Down a small bank from the Vills is a sandy bluff, excellent for play or to just enjoy as part of your vista. All the Villas offer a true ocean front experience. You will see whales, dolphins, and sea lions, as well as the crashing waves, and the change in tides. Right down the beach is the local surfing spot. These are the only Villas on the coast in which all of the bedrooms are ocean front. The Villas start at 4000 square feet, 3 bedrooms, 3.5 bathrooms, with a 2 car attached garage. Villas can be customized. For example, a 3 bedroom Villa can be made into a 4 bedroom Villa and a private swimming pool and or hot tub can be added. Each Villa has an impressive foyer with a tall ceiling, elegant travertine stairs, a large custom wood door, and plenty of natural light. The kitchen is fully equipped and open with a granite bar. The formal living area is huge with enough space for seating 10 comfortably. The living area is right at the heart of where the outdoors and indoors meet. 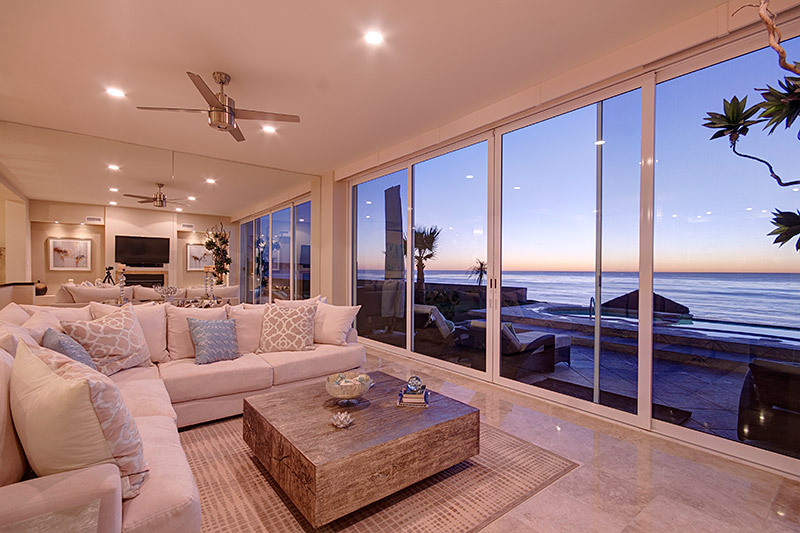 Enjoy an ocean lifestyle right from your couch. Each villa has a master bedroom on the first and second level. There is a large ½ bathroom on the main level. All of the bathroom suites have double vanities and all the bedrooms have a walk-in or walk-through closets. Fireplace included in the living area.